Whoever is a guitarist knows him. Andreas contacted me in 2012. He plays, among others, modelers and was looking for an amplification for it. 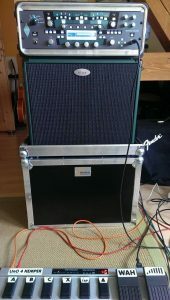 In 2013 he got a BlueAmps “212 FR-A” and made a few presentation videos. 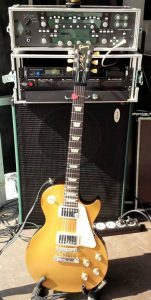 His dream always was an active wedge with 2×12″ in stereo, which I built him in 2013 with the “ASM Wedge” according to his ideas. 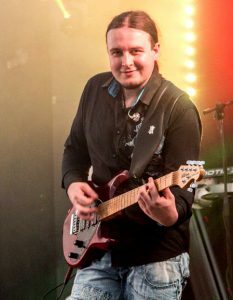 Andreas Schmid-Martelle, short Martelle, played as a guitarist of the Jule Neigel Band in 1988 to the audience. During his time in the band up to the year 2002 Martelles activities included composition, arrangement and production besides the guitar responses. The band sold about two million records. 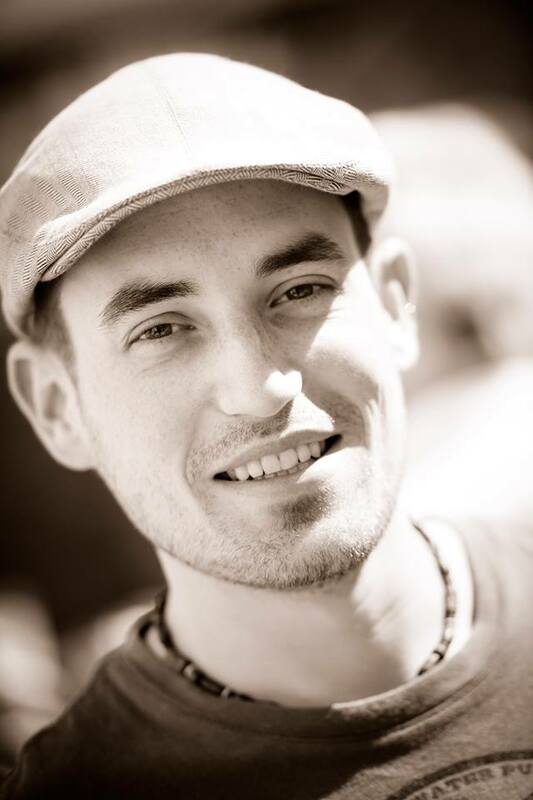 For a long time, Martelle has been concentrating on writing and producing, for the Popvirus Label he has been producing album on album since 2008. 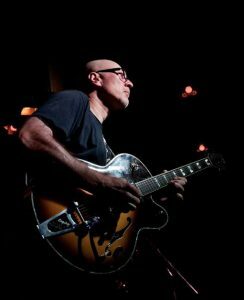 He is also a live guitarist with the latin / lounge band Jazzamor. From time to time there is also a Martelle solo album, most recently the 2010 “The Doors Will Open”. Rolf has studied at the G.I.T. (Guitar Institute of Technology) in Hollywood, California, was a member of the “Crackers” and played national and international tours alongside Nigel Kennedy. 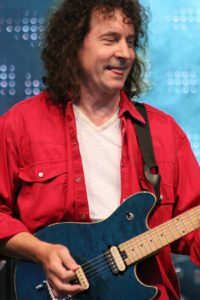 Since 1985 he has been a professional musician and has been teaching since 1991 at the “Future Music School” in Aschaffenburg. Perfomances with: Frankfurt City Blues Band, Rodgau Monotones, Big Band 81, Rodgau Jazz BigBand, HR-Big-Band, Bob Mintzer, Gerd Putscheff, Christoph Spendel, etc. Rolf plays electric and acoustic guitars through a Kemper KPA and a BlueAmps “Blue 3”. 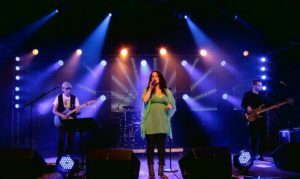 Since 1990, Björn Diewald has been one of the most experienced musicians in his area in numerous, musically enormously diverse formations on stage and in the studio. 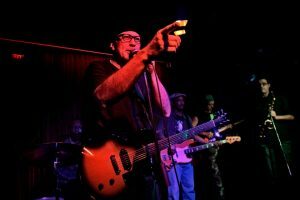 As a bandleader and co-worker, teamplayer, producer, singer, guitarist, keyboardist, bassist and successful songwriter he also occasionally comes on television or on the radio. 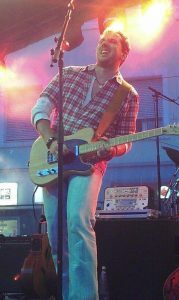 With his countryrockformation NASHFIELD, Björn published his debut album “One” in late summer 2013. Björn plays electric guitar, lapsteel, mandoline and acoustic guitar through a Kemper KPA and a BlueAmps “212 FR-A”. 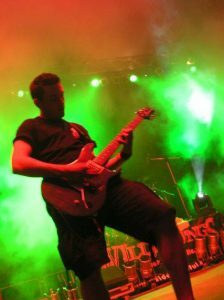 Stefan is guitarist of the top-40 band “Atemlos” and has long been a friend of mine. 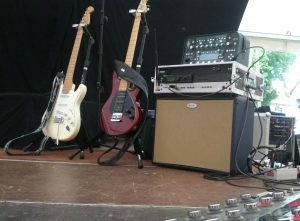 About BlueAmps, he was always quite well informed and sold his Engl, bought a Kemper and got me a BlueAmps “Blue 3”. It is rumored that he has been standing on the stage with permanent grins since then and only needs 10 minutes for set-up. 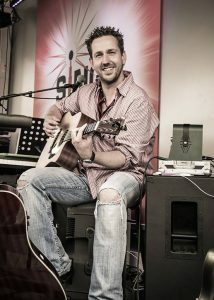 Manuel studied guitar and singing at the “Rock Pop Jazz Academy” in Giessen with teachers such as Peter Fischer and Ole Rausch (Laith Al Deen). 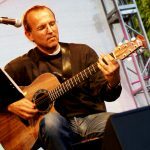 After completing his studies in 2013, he is a professional guitarist, singer, songwriter and bandcoach, teaches at music schools and plays in different bands and projects. 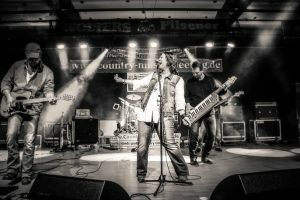 Since 2012, Manuel has been on the road and in the studio with “Viola Tamm”, with whom he won the “German Rock and Pop Award” in 2014. 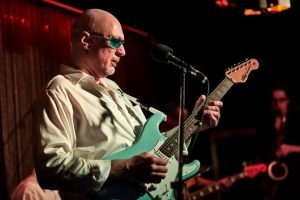 He has also been a guitarist at “Rocktrip” (Rock-Pop-Party-Cover) for many years on the road (including Manfred Mann’s Earth Band). In the Beatles Tribute Show “Be4tles”, Manuel has been giving George Harrison since 2014. “Be4tles” is by the way the only Beatles Tribute band with a “real” Paul McCartney! Manuel plays guitars and basses(!) through a Kemper KPA and a “Camper 212”. 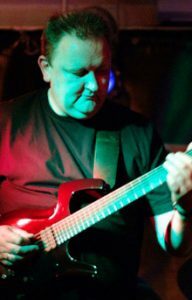 Jürgen is one of the most active professional guitarists in the music scene in and around Magdeburg, as well as teacher and producer. He was part of “Reggaeplay”, “Les Länett” and the “Rock’n’Roll-Orchestra”, and beside his brother Gregor Schienemann, one of my personal heroes, when I started playing. 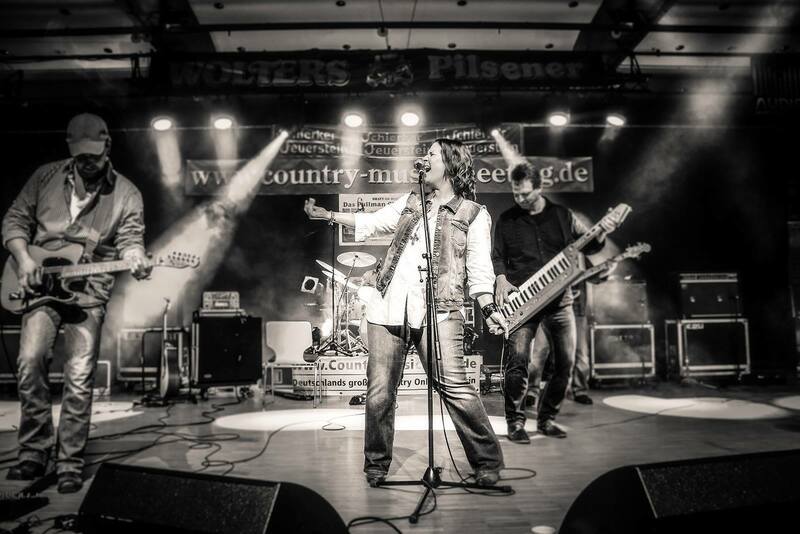 Jürgen is currently playing with the legendary “Kellergeistern” and the cover band “King Song”. Jürgen was looking for a suitable amplification for his Kemper and so it came what had to come. He landed one evening in my house, was convinced and got a “Blue 3” with the “Blue 3 Sub” in his desired color. Guido is a teacher at his own music school “Tonika” and guitarist of the prog rock band “Morphelia”. 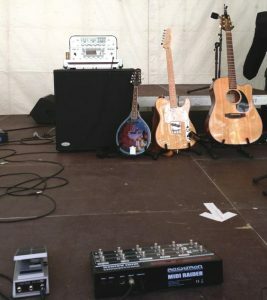 He plays an Axe-FX II and the Kemper KPA through a BlueAmps “Blue”.